Practice Compilers questions and answers for interviews, campus placements, online tests, aptitude tests, quizzes and competitive exams. This set of Compilers Multiple Choice Questions & Answers (MCQs) focuses on “Automatic Error Recovery in YACC – 2”. 1. Which of the following is the fastest logic ? Explanation: In electronics, emitter-coupled logic (ECL) is a high-speed integrated circuit. Explanation: This corresponds to starting at the leaves of the parse tree also known as shift-reduce parsing. Explanation: Ambiguous grammar has more than one parse tree. Explanation: In computing, an optimizing compiler is a compiler that tries to minimize or maximize some attributes of an executable computer program. Explanation: It is a program that takes one or more object files generated by a compiler and combines them into a single executable file, library file, or another object file. Explanation: It has two inputs and one output. Explanation: More loops are added. Explanation: Execution speed is enhanced by sacrificing bits. Explanation: Displays only some part of the data. Explanation: Also known as shift reduce parser. 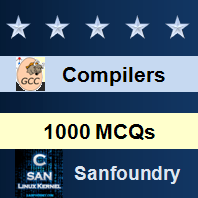 Sanfoundry Global Education & Learning Series – Compilers. To practice all areas of Compilers, here is complete set of 1000+ Multiple Choice Questions and Answers.